Protesters were outside Boston's Opera House Tuesday evening where inside Hillary Clinton was speaking to a sold-out crowd at a stop on her international book tour. Clinton says it was a painful process to write her book "What Happened" in the wake of her defeat to Donald Trump. Hillary Clinton returned to New Hampshire for the first time since the 2016 election on Tuesday, basking in a warm welcome and brushing off a question about President Donald Trump's unsubstantiated claim that rampant voter fraud led to her victory in the state. 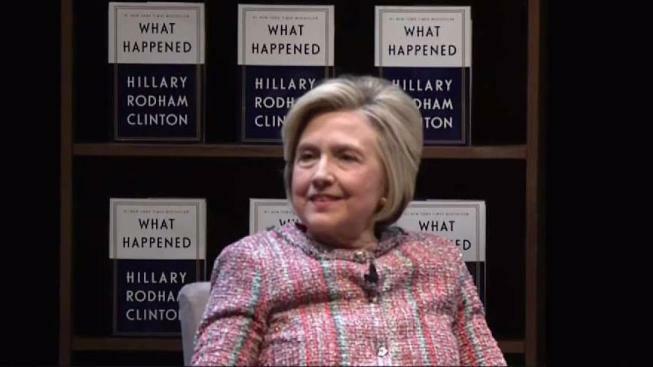 About 1,000 people waited outside in light rain to meet the former Democratic presidential nominee and get a signed copy of her new book about her failed 2016 campaign, "What Happened." "I love coming to New Hampshire, and I love the friends that I've made over 25 years now. So any chance I have to come back, I am anxious to take it," she said shortly after the signing got underway. Clinton won New Hampshire's four electoral votes, though Trump insists he lost the state only because "thousands" of people came by bus to vote against him. He also has created a commission to investigate allegations - offered without evidence - that millions of people voted illegally nationwide in 2016. Asked about those claims by the Republican president, Clinton demurred. "Well, you can read my book and find out what I think about that," she said. Karolyn Carpenter, 65, of Tilton, was more blunt. "Oh, please. Any time he opens his mouth, it's a lie. Don't even get me started," she said. Carpenter said she is a longtime Clinton fan but hadn't met her in person until Tuesday. "I feel the same way she does: What happened?" she said. "I think Trump is destroying our country." Geena Chiumento, 23, came from Boston to meet the first person she had ever voted for in a presidential election. She said she has been reading Clinton's book and enjoying learning more about her likes and dislikes. "I think I just really appreciate how open and honest it is," she said. She arrived several hours before the doors opened and ended up running to a nearby store to buy new socks to stay warm. "It was worth it," she said. "I'll always remember these socks now." Protesters across the street from the bookstore included supporters of U.S. Sen. Bernie Sanders, Clinton's main opponent in primary elections, and perennial candidate and performance artist Vermin Supreme, who went to court to get permission to bring a pony to the event. Chris Balch of Wilton held a large banner thanking Sanders "for making Medicare 4 All household words." He said he wanted to remind voters that Clinton represents a corrupt system that rewards corporate greed. "Bernie does not do that, so it's important to spread that word at every opportunity," he said. "Does it do any good? I don't know. I don't really know." Later Tuesday, Clinton was to be honored with the Big Sister Association of Greater Boston's "Believe in Girls" award for working to improve the lives of women and girls.